Avoid These Consequences of Sleep Apnea in Canton Today! Sleep apnea takes a huge toll on your body and your quality of life if you don’t treat it in a timely manner. In the beginning, you may only experience some fatigue and maybe mood swings from lack of sleep, but as the time passes, sleep deprivation could affect the whole body! Learn more about sleep apnea in Canton and how you should treat it with the help of your local dentist in this week’s blog post. Lack of sleep impacts your ability to function correctly throughout the day. Your brain functions may become slowed, decreasing your ability to concentrate or critically think. As mentioned above, your brain’s functions become slowed with less and less effective sleep. You could doze off at the wheel causing an accident or you could have impaired reactions to other cars on the road surrounding you. When your body isn’t properly rested, your overall health can begin to suffer. In fact, those with sleep disorders are more likely to develop diabetes and cardiovascular problems, like heart disease or even strokes. One of the earliest signs of sleep deprivation is the inability to have a consistent, happy mood. You’ll experience mood swings that range from anger to sadness and even irritability. Your relationships will also suffer from this. Continuous positive airway pressure therapy (CPAP) is a standard form of treatment that many health professionals rely on—but there are many patients who are CPAP intolerant. Rather than wearing an uncomfortable mask while trying to rest, your dentist offers customized, travel-size oral appliances. Oral appliance therapy is just as effective—if not more—than CPAP therapy and has helped countless patients. Your dentist will craft a personalized oral appliance for you to wear throughout the night. It physically opens the airway so that you can breathe without issues. Comfortable wear throughout the night. An easy shift of the jaw or tongue to clear the airway. Small and portable for easy travel. Customized to your own mouth to address your specific sleep apnea cause. Simple to use and non-surgical. 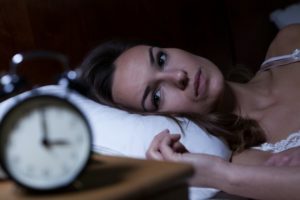 Are you ready to explore your options for treating your sleeping disorder? The sooner you seek treatment, the sooner you’ll be able to feel well rested and eliminate the potential health concerns that come with obstructive sleep apnea! Here at Robinson Dental Group, we know how great it feels when you are well rested. You literally feel like a million bucks! With that being said, we want everyone to feel that way. If you experience difficulties getting a full night of effective sleep due to a sleeping disorder like obstructive sleep apnea, just know that treatment is only a phone call away! Comments Off on Avoid These Consequences of Sleep Apnea in Canton Today!